Love and care are poured into each piece and are apparent in the quality and luxury of our products. For decades, Michael Desforges improved and perfected the art of printing, framing, and presenting photographs and artwork. From this experimentation came The Wooden Gallery Process™, the gallery’s namesake process of beautifully presenting and preserving images for a lifetime. With a hand-applied emulsion, timing is key. This one-of-a-kind finishing captures your image’s vibrancy and creates a tactile experience. Once finished, your artwork is gorgeously presented either frameless or in an oak frame, handcrafted in the Traverse City, Michigan gallery. Every piece that leaves The Wooden Gallery is original and has been created, hand-sanded, and hand-finished with precision. When you choose The Wooden Gallery, Michael and Gallery Manager, John Korzek Jr., will expertly guide you through the process of selecting custom artwork or images with centerpiece-worthy framing options—whether it be for your home or business. From start to finish, they will be there for you, making sure your experience is positive and your finished piece is as unforgettable as your cherished memory. We’re dedicated to giving back to the community. The Wooden Gallery is a consistent supporter of and contributor to numerous local organizations in the Northern Michigan community such as Gladhander, Zonta, and the Friends of TC Tennis Association. Michael Desforges, founder of The Wooden Gallery, learned about acrylic emulsions as a young man while teaching French at the University of Toledo. During his summer break, he worked for a business that used an emulsion process for decals. “I became so fascinated,” said Desforges. During a nine-month break from teaching, he developed the emulsion that led to his present product. Michael began experimenting with acrylic emulsions as a way to preserve prints and photos. The concept was to create a product where the image—not the framing—was the point of focus, presenting in the highest esteem what the artist or photographer created. Several nationally-known artists have their limited edition prints finished with The Wooden Gallery Process™ for their customers. Originally from Detroit, Michigan, Blu Rivard moved around the world to study and paint breathtaking scenes. From the serene beauty of his undersea lifescapes to the graceful majesty of his exotic wildlife studies, Blu’s work delights the eye. To date, his images have been exhibited, distributed, and collected in nearly fifty countries. When PADI, the Professional Association of Diving Instructors, wanted to hang Rivard’s painting in their Ranch Santaria, California headquarters, Rivard produced his prints with help from The Wooden Gallery. The qualities of The Wooden Gallery Process maintained the unique interplay of color, light, and texture that is eminent in Blu’s work. Casey Truelove put the finishing touches on his painting, “Crucifixion,” a rendition of a painting he saw at church. About the same time, Casey was getting ready to attend World Youth Day in Toronto, an event started by and attended by Pope John Paul II. 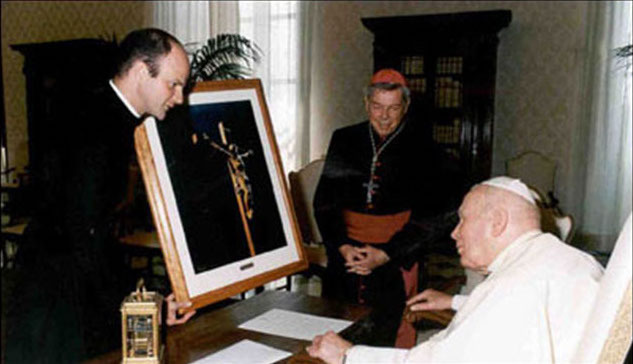 As a token of his appreciation, Truelove wanted to present the Pope with a framed print of his work. Enter The Wooden Gallery. Owner Mike Desforges is one of Casey’s biggest fans. They met years ago when Casey was a student at St. Francis and would wander through the gallery, admiring Michael’s work. “[His work is] very distinctive; you can always tell a Wooden Gallery piece,” the young artist said.